Damage panel collects battle actions and shows info about your damage/heal. 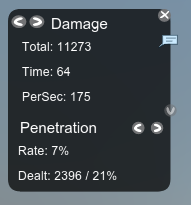 It shows general statistics about damage (total damage, DPS, battle time) and heal (the same). 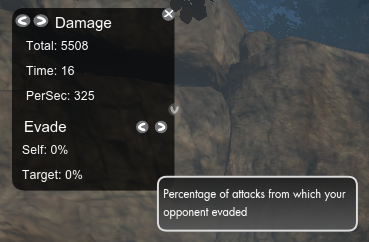 Also you can see detail info, such as percent of critical/penetrated hits, blocked, glaced or evaded attacks. If you want send more detailed info (include crit, penetrate, etc), let me know. Unzip the DamagePane.zip file into "The Secret World\Data\Gui\Customized\Flash"
[NOTE] If you close window use "/option DamagePane 1"
I can't seem to get this to work, I am currently using Custom UI, CET, Viper's Deck Manager, and Valet 2.0. 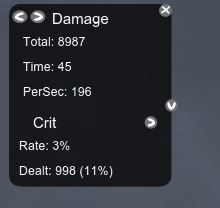 Does anyone know if Damage Panel doesn't work well with any of these mods? Sorry, i stopped work on this addon. But i uploaded source files, may be someone make this better. -command or button to bring the window back up. The author answers this question earlier down the page. Sorry, but this week(maybe next one too ), i can't do anything for addon - milestone at work..
Any way to get this addon and Deck Manager work at the same time? Can you make the window save it's position so we don't need to move it after every restart? The more you learn, the more you know. The more you know, the more you forget. The more you forget, the less you know. Last edited by OneMember : 09-08-2012 at 10:30 AM. Thank You for this nice piece of work. Any chance of getting the ability to lock the window in place. Having to drag it to where i want it everytime I need to /reloadui due to funcom bugs gets a bit annoying. j'ai installer l'adon mais il ne marche pas même après avoir utiliser la commande et tout ce qui était possible. * check location of DamagePane folder: "The Secret World\Data\Gui\Customized\Flash\DamagePane"
I've spent a little time at the statistics of healing, though I'm playing as a healer. Will try to fix it at next version. Looks nice. 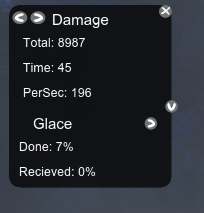 One minor issue, Glance is misspelled, it shows up as "Glace" in your mod. bonjour votre addon marchais tres bien jusqu'au moment ou j'ai cliquer sur la petite croix et depuis impossible de relancer l'addon il a disparue de mon ecran avez vous une commande pour le réactivé ? Last edited by hlsl : 08-27-2012 at 01:41 PM.